Looking for a small railroad on which to base a model? Like rolling countryside and boxcars? Have a penchant for small diesel engines? Want simple layouts that can be built as stand-alone modules, and connected together when there is more space? 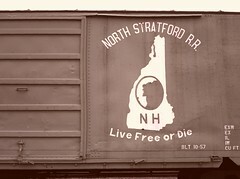 Then look no further than the North Stratford Railroad Corporation (NSRC), an example of New England Yankee thrift and ingenuity. To be honest, there was not much to it: a 44-tonner, an Alco S1, and 100 40′ boxcars, all of which have been or are in production in most modelling scales. Trains ran on a couple of days a week: firstly to sort out the loaded cars and swap them with the empties, and then to run the loads down to the CN (Grand Trunk) interchange, returning with new empties. 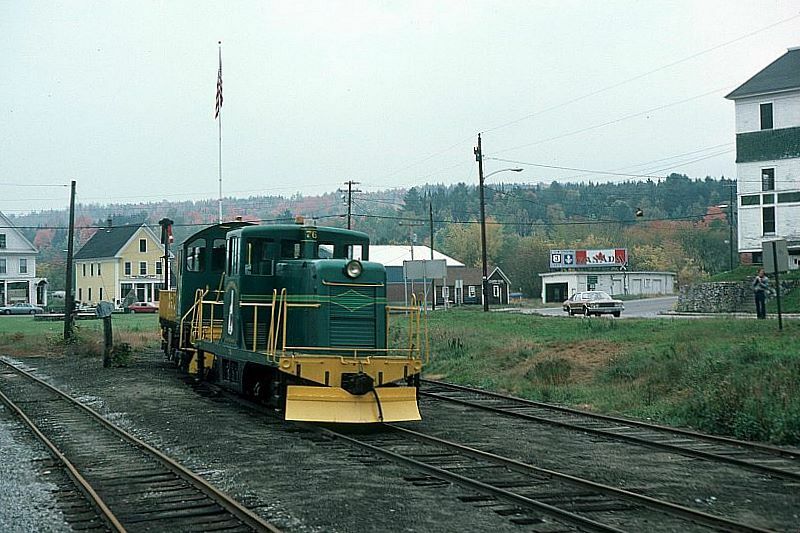 The primary service was a furniture factory in Vermont, but the railroad was supported by the State of New Hampshire, which provided the lease on the track bed. The terminus, at Beecher Falls, was just south of the Canadian border. There are some very nice pictures on the net: a simple search will turn them up, but for more information including layout plans, look no further than the ever wonderful Trainlife website, where all is explained. This entry was posted in Prototype, S Scale on September 2, 2013 by Simon. Neat post. I was thumbing through my copy of Carsten’s book New England Shortlines and re-reading the pages of the North Stratford. It’s an almost perfect subject for a small layout featuring beautiful scenery, piles of layout-friendly 40′ boxcars and the crew’s preference to use a 44 tonner for the work. As for customers, Ethan Allen is about as perfect as it gets I think. I hadn’t seen the Trainlife reprint of the Prototype Modeller article though and I really enjoyed reading that. Thanks. Sure is an alluring prototype. Of course, being a native N scale modeller I was thinking about how easy it would be to model this in N lately. Bachmann have an S4 that could be repainted and their 44 tonner would work. Mind you, in HO there’s even more available and a quick check of eBay shows lots of Roundhouse and also Bev-Bel (Athearn) boxcars available. The layout concept also suits itself nicely to something around the walls of a room, starting off as a simple shelf layout. I agree with all the arguments toward S. They all make so much sense. I have built a couple of narrow gauge cars in S just to test the size and I quite enjoyed the experience. As the price of HO and N models creep upward the cost of S isn’t really so off-putting. Starting off as a simple shelf layout does really speak to the space I have available. Thanks for putting this post together in the first place. I see Trevor Marshall has put together a nice follow-up post on the line too.